After years of thinking about it (and at least one year of whining about it), I have accomplished an item on my bucket list! Longstanding blog readers may recall my desire expressed on Feb. 14, 2011, to hear the audio letters my dad dictated to his family back in 1961. (click here) The letters were recorded onto small green vinyl discs and can be heard in one of two ways: on a SoundScriber dictation machine (hard to come by); or on a turntable without an automatic stylus-lift. I had neither. Today I have great news. Thanks to my very nice neighbor, Michael, I have not only heard the letters again, but I’ve created MP3 files from each one. Here’s how it came about. One day, in passing, I mentioned to Michael what I was trying to do. I thought he’d be interested in my search because he has a collection of vintage radios, and secretly hoped maybe he'd picked up a SoundScriber at a garage sale. “I might have equipment that you could use for your project,” he said. The equipment was new for him, though, and he wanted to set it up and try it—to make sure it would accomplish the task. He spent at least half a day working with one of the little green discs before he was happy with the results, then telephoned triumphantly. It’s odd, hearing your deceased parent’s voice after a fifty year hiatus. But it was thrilling. The next day, Michael carried the equipment to my house—a special turntable that hooks into a computer—and loaded software onto my laptop, then patiently showed me the steps to convert the spinning little green discs into electronic files! “No hurry to return it—keep it as long as you need it,” were his parting words as he left to walk to his home just two doors away. I couldn’t wait, though , and sped through the project in just a few days. The quality of the recordings is poor—with warps and skips and crackles and pops—as Hubby said, “sounding akin to an Ed Murrow news broadcast recorded by Thomas Edison.” But the content of two-dozen audio segments, as well as the lingering presence of my dad, unfolds with the listening. And for that . . . I am most grateful to my neighbor, Michael. I will write more about the SoundScriber letters in coming posts. For the life of me, I couldn’t figure out what would be in those drawers. Then I thought about how fearless those workers have to be to lean out from a cherry-picker into wires or trees, and I realized they need guts to do that job! Maybe there are times when it is so scary in the bucket, they need extra courage. Maybe the drawer is so you can pull out a pile of rubber guts to augment your own. Do you wear them? Ingest them? Juggle them? Whatever, I hope they help. I could more easily imagine what the grunt bags might be for. I'll bet that drawer holds large bags to hand to the people who are on the job but doing nothing useful. We’ve all seen them: they stand around pointing, chatting, spitting . . . while the worker is sweating bullets in the cherry-picker. The useless people could be handed a grunt bag and told to get to work picking up street refuse. Or . 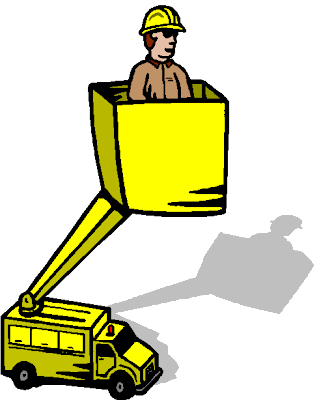 . . perhaps the worker in the bucket could drop them over the heads of those workers who are not doing their share! When the traffic light changed, I couldn’t help but think how rubber guts and grunt bags might be useful at my house. I can think of times they’d come in handy. I buy cut flowers every week. Not only is a touch of color welcome in a home decorated with paints and fabrics called sand, seascape, chamois, and misty-morn, but it feels homier to have a vase of flowers on the coffee table. This week no flowers will cross my threshold. Why? Because it’s Valentine’s week. The same sized bunch of cut tulips that last week cost $4.00, this week is $7.00! 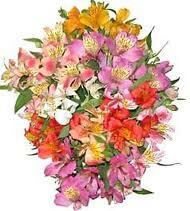 The bouquet of asters and Alstroemeria usually priced between $6 and $8 is priced at $19.99 this week.The red, pink, and white bouquets frequently on ‘Manager’s Special’ for under $10 are priced at $24.95! I’m not talking florist prices, either. After checking two different supermarkets (in different chains), I walked away empty handed. At the next store I spoke to the flower manager. “I buy flowers every week, but this week I refuse to pay twice as much as I did last week,” I said. Men! Are you out there? Reading this? Do NOT buy your sweetheart flowers for Valentine’s Day! You are being screwed (and not in the way you want to be--pardon my crudeness). Perhaps you could buy your sweetheart a book, instead. There are plenty to choose from, and their prices are never marked up from one week to the next!